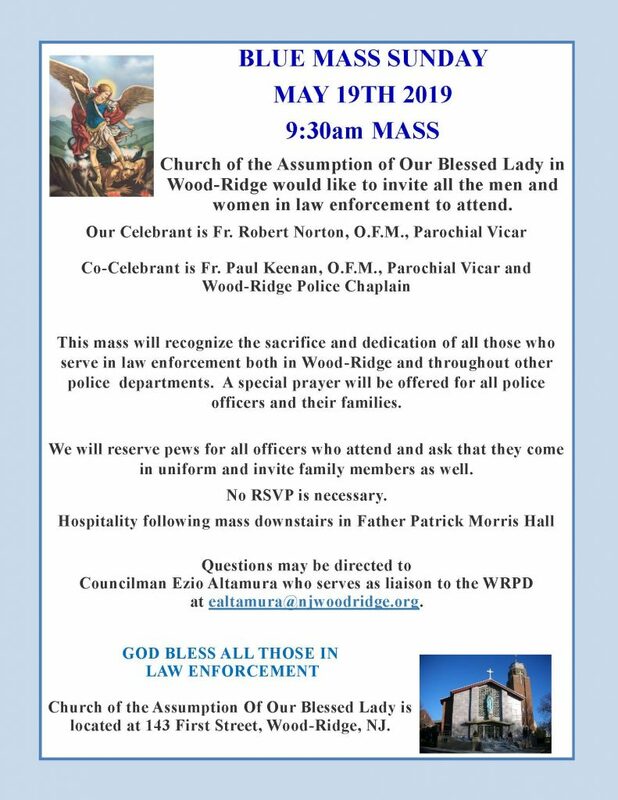 Church of the Assumption of Our Blessed Lady would like to invite all the men and women in law enforcement to attend the annual Police Blue Mass on Sunday, May 19, 2019, 9:30AM. This Mass will recognize the sacrifice and dedication of all those who serve in law enforcement both in Wood-Ridge and throughout other police departments. A special prayer will be offered for all police officers and their families. We will reserve pews for all officers who attend and ask that they come in uniform and invite family members as well. No RSVP is necessary. Hospitality following mass downstairs in Father Patrick Morris Hall. Church of the Assumption Of Our Blessed Lady is located at 143 First Street, Wood-Ridge, NJ. Questions may be directed to Councilman Ezio Altamura who serves as liaison to the WRPD at ealtamura@njwoodridge.org.